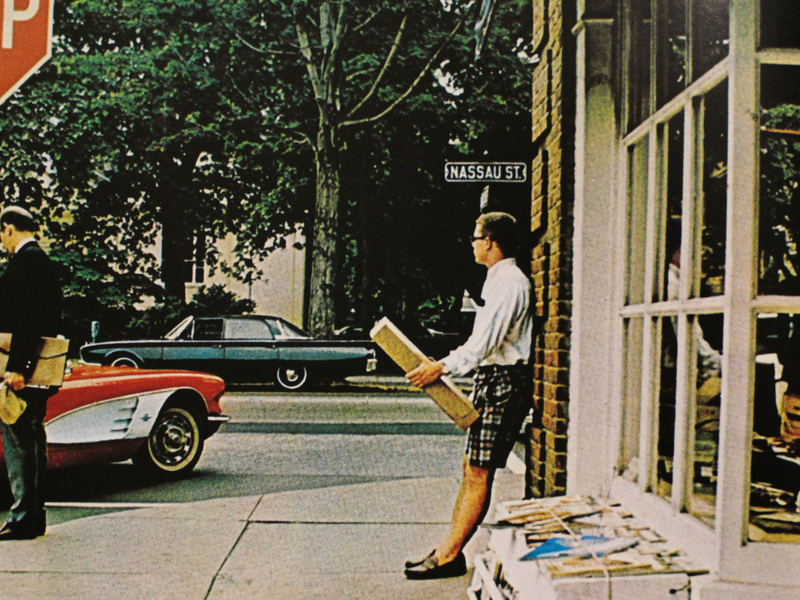 Review: "Take Ivy" - your complete guide to vintage US style - Well Dressed Dad - It is a proper menswear blog. Like, with original words and opinions and suchlike. This weeks book is a natural follow-up to my recent review of “Ametora“, the book about how the Japanese adopted the Ivy style from the US, improved it and exported it back. Well, in few words at least, the story is twistier and more involved than that. Yet “Take Ivy”, in both film and book, was instrumental in the process, and hence all that followed on. As in how Japan became the word leader in heritage fashion and streetwear. The initial “Guide to Ivy fashion” by Van Jackets. More than anything it displayed a total confusion as to what Ivy might be. We need to go right back to 1965 though, when Shosuke Ishizu was busy selling in the concept of Ivy in Japan. He already had the company to produce clothes and he had almost total influence over the primary, if not only, men’s fashion magazine in Japan. Yet somehow things weren’t coming along as well as hoped. 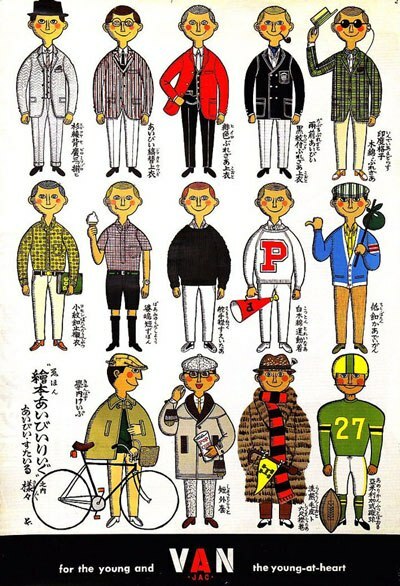 The Japanese like rules and clarity, and Ivy League fashion was complicated. Or was it? Part of the problem was that very few really had much of an idea what it really was. Air travel was expensive and people generally didn’t travel much between Japan and the US. What little info was available was devoured, deconstructed and analysed, but it still felt incomplete. So, a team was sent to the US to document the Ivy fashion as fully as possible. The idea was to visit the 8 Ivy League universities and document style savvy young men sauntering around in their Ivy high fashion. This was to be done both on film and photo, and with plenty of notes. The problems they met were numerous, but most overwhelmingly, and probably quite devastatingly disappointingly: There was hardly any Ivy style to be seen! Fashions had moved on and the style they had been studying was no longer in vogue. Students were not smartly dressed in jackets and ties, they were slobbing around in sweatpants and t-shirts. They made the best of it by photographing what they could find, and managed to stage other photos by, well, having students dress up. They did a pretty good job of it though, and even though they never did get to visit all 8 universities, the result does appear quite plausible. 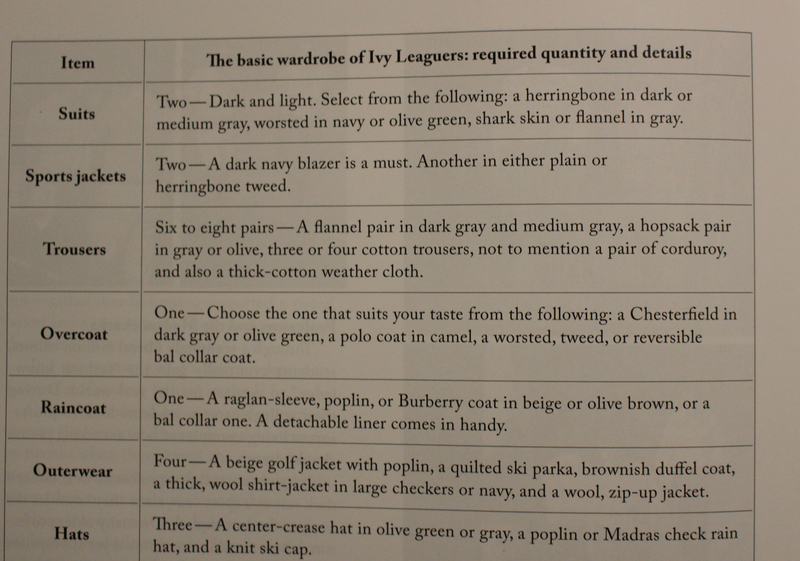 Part of the “The basic wardrobe of Ivy Leaguers required quantity and details” – getting the rules down! As this book was only published in Japan, the the notes and captions were all in Japanese until the 2010 release of this translated edition. All the translations are as verbatim as possible, so the text has the charming naiveté of the original notes. Keep in mind that there was only limited language skills and translation, so many of the observations and facts are very much interpreted on the hoof. It makes for quite a charming little book though, covering a fair amount of information on it’s 140 or so pages. The information in it has nominal relevance today, but as a historic document it is fascinating. And of course, the influence it has had on men’s fashion is enormous. Without the Japanese fascination with Ivy, the world of menswear would be quite different. And it makes a great companion to “Ametora“, which you really should buy! As a bonus, I found this clip that I believe is from the original “Take Ivy” film, cool jazz and all! Available from the usual sources at around 20 pounds. 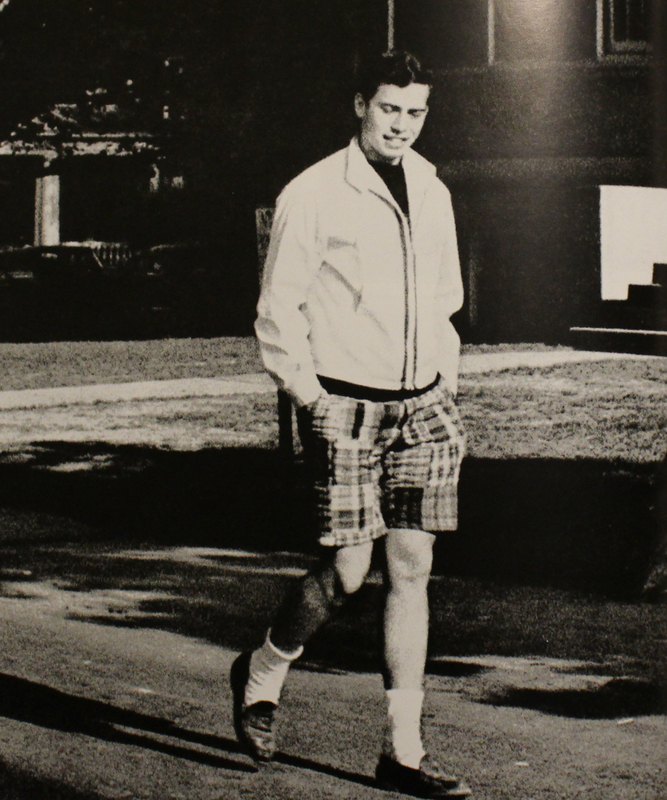 The shorts with loafers are so actual! I saw other articles about Ivy League. Though I’d mainly pair them with t-shirts or button shirts short or long sleeved and well fitting, not that baggy sort of sweater, at least personally, not that it looks that bad (:.